The Genesis Gen2 line of LED Lanscape Burial Lights are the most versatile LED fixtures on the market today. Various beam spreads and wattages allow for a customized finish to any property. The high end residential grade system was designed for 120V operation residential applcations. NOTE: A Techlight Surge Protector must be incorporated into the LED system at the beginning of each circuit as a minimum. Failure to do so will void the system warranty. Fixture operates at 120V input voltage. Nominal open circuit current .15 amps. 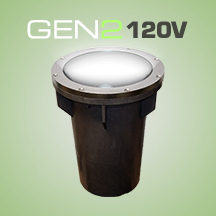 A 17 watt LED source provides approximately 1086 (CW) Lumens of light. System is compatible with the use of a rotary TRIAC Dimmer.